A bit over a year ago I spotlighted Collex, a set of tools for COLLecting and EXhibiting information in the humanities. Collex was developed for the NINES project (which stands for the Networked Infrastructure for Nineteenth-century Electronic Scholarship, a trans-Atlantic federation of scholars). Collex has now spawned Blacklight, a library faceted browser and discovery tool. Blacklight is intended as a general faceted browser with keyword inclusion for use by libraries and digital collections. As with Collex, Blacklight is based on the Lucene/Solr facet-capable full-text engine. The name Blacklight is based on the combination of Solr + UV(a). 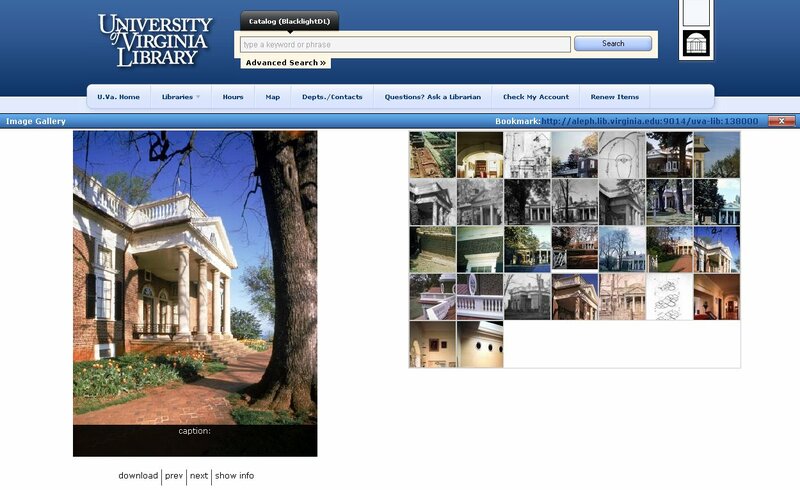 Blacklight is being prototyped on UVa’s Digital Collections Repository. It was first shown at the 2007 code4lib meeting, but has recently been unveiled on the Web and released as an open source project. More on this aspect can be found at the Project Blacklight Web site. Blacklight was developed by Erik Hatcher, the lead developer of Flare and Collex, with help from library staff Bess Sadler, Bethany Nowviskie, Erin Stalberg, and Chris Hoebeke. You can experiment yourself with Blacklight at: http://blacklight.betech.virginia.edu/. The figure below shows a typical output. Various pre-defined facets, such as media type, source, library held, etc., can be combined with standard keyword searches. BlacklightDL is also working in conjunction with the OpenSource Connections (a resource worth reviewing in its own right). Blacklight has just been released as an open source OPAC (online public access catalog). That means libraries (or anyone else) can use it to allow people to search and browse their collections online. Blacklight uses Solr to index and search, and uses Ruby on Rails for front-end configuration. Currently, Blacklight can index, search, and provide faceted browsing for MaRC records and several kinds of XML documents, including TEI, EAD, and GDMS; the code is available for downloading here. 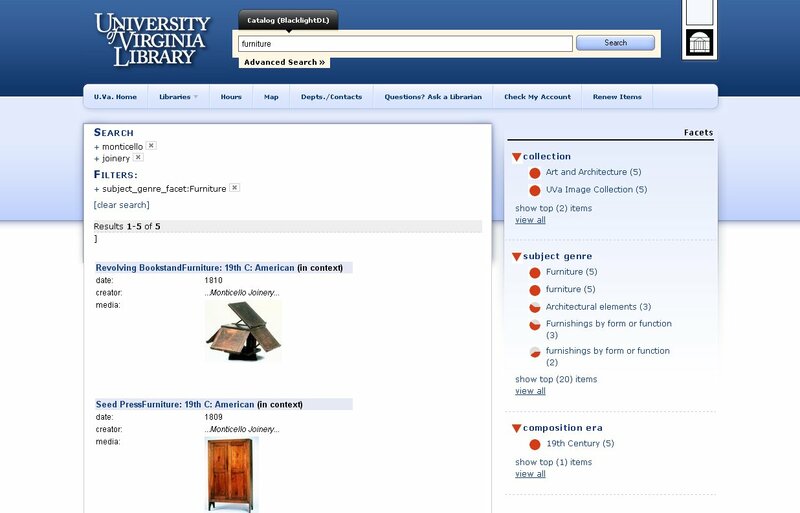 There is a rich and relatively long history of faceted browsing in the humanities and library science community. Notably, of course is Flamenco, one of the earliest dating from 2001 and still active, to MIT’s SIMILE Exhibit, which I have written of numerous times. Another online example is Footnote, a repository of nearly 30 million historical images. It has a nice interface and an especially nifty way of using a faceted timeline. Also see Solr in Libraries from Ryan Eby. The library and digital media and exhibits communities (such as museums) are working hard at the intersection of the Web, search, display and metadata and semantics. 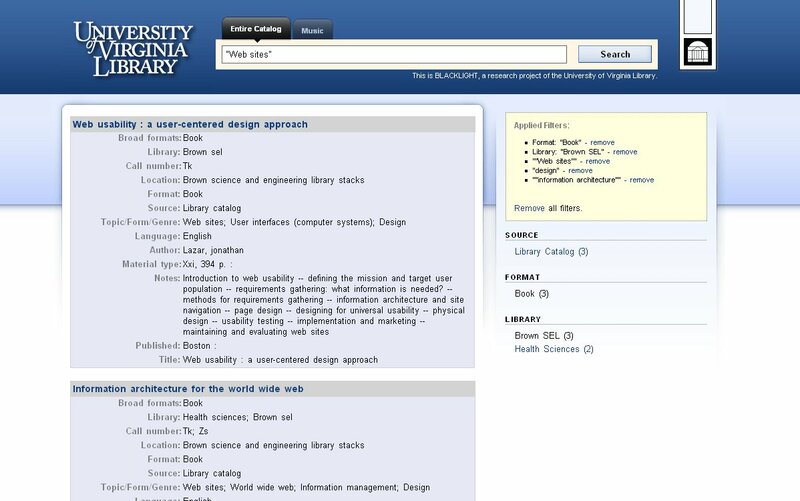 For example, we also have recently seen the public release of the Omeka exhibits framework from the same developers of Zotero, one of my favorite Firefox plug-ins. And Talis continues to be a leader in bringing the semantic Web to the library community. The humanities and library/museum communities have clearly joined the biology community as key innovators of essential infrastructure to the semantic Web. Thanks, community. The rest of us should be giving more than a cursory wave to these developments. BTW, I’d very much like to thank Mark Baltzegar for bringing many of these initiatives to my attention. As one of the OpenSource Connections developers on BlackLightDL, thank you very much for your kinds words about BlackLightDL. The more interconnected we become, and the more data is at our finger tips, the more important it becomes to be able to find patterns and visualize them. What I find interesting about both BlackLight projects is how simple they are to set up, especially in comparison to some other digital content repositories. Both projects aimed to do one thing well: leverage Solr to provide faceted browsing, and therefore are scoped accordingly. And because they are open source, they both provide the kernel of functionality that can be embedded/integrated in many other systems. Setting up a BlackLight instance to provide faceted browsing of all the documents in Wikipedia for example is a very simple doable project. Just another ringing endorsement of the work of Matt Mitchell and Bess Sadler, who are the UVA programmers currently taking Blacklight forward — and I can’t help commenting how odd it is to have been managing the Collex/NINES project when you mentioned it a year ago, and then be managing this work as you pick it up now! Thanks again for noticing the project, Mike. We’re hopeful that open source development of Blacklight will really take off now that we’ve released it on Rubyforge. There certainly seems to be interest in the larger library community. Thanks for noticing, but, more importantly, thank you for continuing to contribute to the community. One recommendation is to make the BlacklightDL prototype less hard to find; it really is very cool!